PLA, PET(G), Flex, ABS, PVA, Wood, Glass, etc. We managed to create a printer with the DNA of our award winning FELIX 3 series and a focus on ease of use. By closely listening to our community and existing customers we’ve developed the Pro 2 from the ground up with basically all required features to print at a professional level silently next to you on your desk. The FELIX Pro 2 features full mechanical automatic calibration. 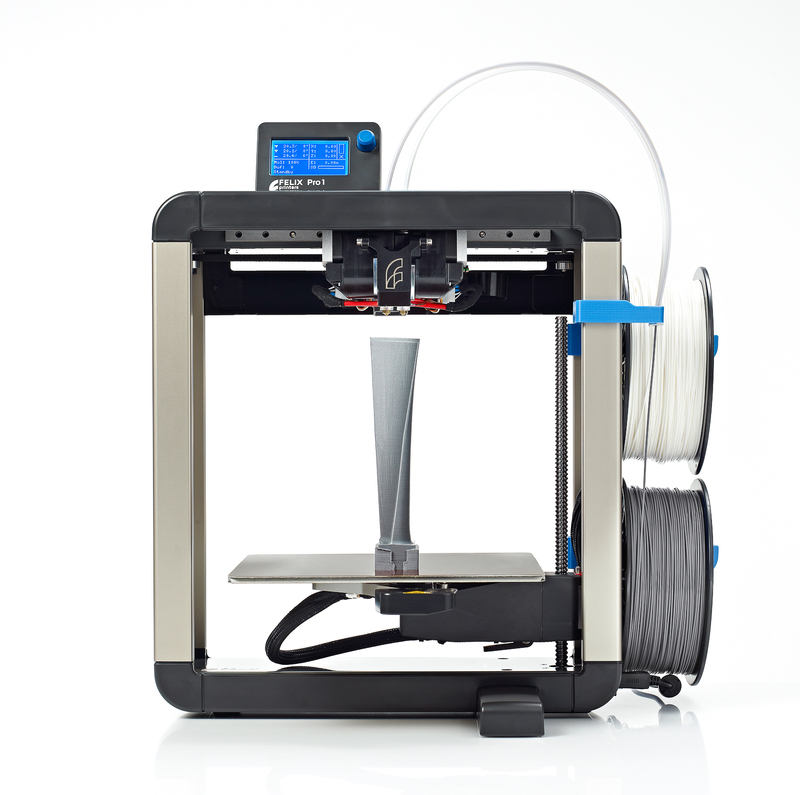 Start printing in the least amount of time and with the shortest possible learning curve. Where software auto leveling is the norm nowadays, we do it mechanically providing the best possible print quality. The FELIX Pro 2 detects the outage or inconsistincies in the used filament. When one of the two is detected, the flow will be adjusted or the print job paused. After resolving the issue, the print will continue to print. Potentially saving you hours of your valuable time and money by preventing print job failure. Take out your print bed, to easily remove printed objects from the print bed once your print has finished. The innovative design of the FELIX Pro 2 comes with the best components available to ensure high quality prints and durable performance..
A clever mechanical system will rotate the second print head when needed. This eliminates interference and heat-exchange between the two print heads.print job paused. After resolving the issue, the print will continue to print. Potentially saving you hours of your valuable time and money by preventing print job failure. Using durable and industrial grade materials for a critical part of the printer, ensures reliable operation and gives you a large range of options regardng printing materials.Next to this, our hot-end is designed to be easily swappable. It takes you less than 10 seconds and no tools required. Ideal if you need a dedicated hot-end for a certain material or several nozzle sizes.. The FELIX Pro 2 operates at an extremely low noise level at just 32dB (comparable to wispering in a library). Giving you the ability to do your job without interuption. 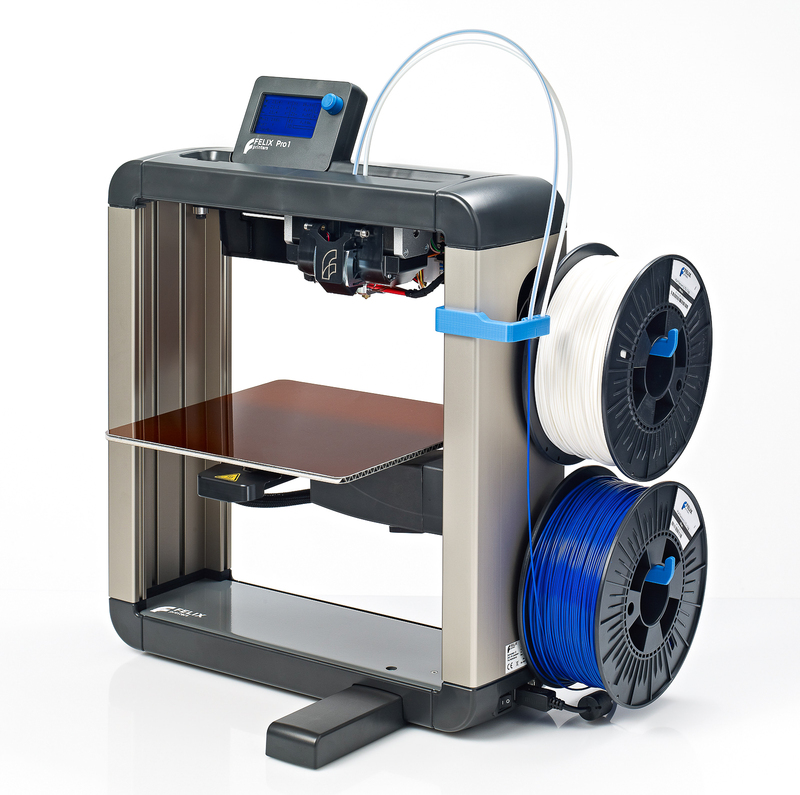 With only 12kg the FELIX Pro 1 is a light weight 3D printer with an open frame makes it easy to carry the 3D printer. Also when you need to travel you can easily put it back into the relatively small box. By adding the Wifi option there is no need to be connected to your 3D printer via USB or put your print files on a SD card. Directly print your 3d model from your pc, tablet or smart phone. Add this functionality by adding the Element to your order. Pro 1 and it’s proven. I am awed by this no noise only work printer. It prints fast and comes with amazing wifi feature that gives you the liberty to experiment with your designs. The Felix Pro 1 also gives you first class parts that need no adjusting. The bed level adjustment is automatic and almost automatic is the printing process with smart nozzle positioning. I give it a full five star rating. Every time I buy a Felix 3D printer it gives me pure satisfaction. The same can be said about this one. It is actually noiseless which means nobody in my family objects to my work. This is a semi-professional printer with some great and some okay features. The great ones are the ability to heat the bed up to 105 degrees, smart nozzle positioning and wifi. The Felix PRO 1 is my third 3D printer. I have had a laser resin printer and more recently a Zortrax M200. The resin printer was a kit and needed a lot of work which I had no time or patience for but the Zortrax was a fine piece of kit. The Felix PRO 1 is also a fine piece of kit. It is well put together and so far has printed well. I was pleasantly surprised to see 3mm thick steel plates attached to the aluminum extrusions. This gives the PRO 1 a nice heavy and solid feel. I have not been using Felix branded filaments so I have to do some tweaking to get really nice prints but even with small tweaks it has printed quite well. I will be using Taulman 3D nylons a lot probably and so far Alloy 910 has printed well and stuck amazingly to the platform with Pritt power sick. I am looking forward to my new Journey with my new printer and couldn't be happier. Received the printer today and it was very easy to get the Felix Pro started. I just finished my first print 'felix gadget' which is on the included mini sd card. It all works very well, thank you for this amazingly quiet printer!